Time Magazine's Man Of The Year! Knicks fans are feeling unseasonably giddy this morning after last night's announced trade with the Portland Trail Blazers. 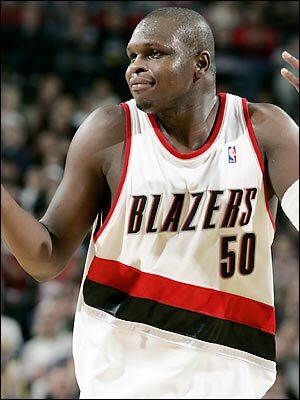 Zach Randolph is coming to New York with his 20 points and 10 rebounds a game while the useless Steve Francis and injury prone softie Channing Frye are going to join Greg Oden in the rains of the Pacific Northwest. There's always a fear when Isiah Thomas makes a trade. He always ends up with the most talented player in the deal but at what cost to the team? Here the cost seems impossibly low for an All-Star forward who gives the Knicks a devastating combo of low-post scorers so what's the catch? Randolph has had some problems with pot, women and teammates in the past but he was relatively calm last year. Does he have pneumonia? A case of the heebies or the jeebies? Past history forces us to ask those questions because when it seems like Isiah gets away with robbery there's usually one of those dye packs that exploded all over John Goodman in the bag of money. Things that appear too good to be true usually are. Will Randolph and Eddy Curry be able to coexist down low? You don't see many teams with a pair of low block scorers who are each capable of drawing doubles and it's not like either one is known for being a great passer. There's also the fact that Randolph further extends the Knicks salary cap issues to make us take a step back and wonder if this deal is as good as it looks on paper. It also doesn't do much to address the team's defensive problems. Does this lead to another trade down the road? The Knicks will have to do something because with Demetris Nichols traded to the club in the second round they have two players too many for the roster and Randolph and/or others could go elsewhere in another deal. While we wait to see if Thomas is going to be covered in paint before getting out of Arizona, let's look at where this puts the Knicks next season. They're a little heavy up front right now with Randolph, Curry, David Lee, the loathsome Jared Jeffries, Renaldo Balkman, Malik Rose, Jerome James, Randolph Morris and first-round pick Wilson Chandler. Chandler, another of the athletic, long types that Isiah's favored in the draft, could replace someone who leves town. The problem is that the three guys you'd happily deal are Jeffries, Rose and James and, while you can never say never in a league with Danny Ainge and Chris Wallace making decisions, they aren't going to garner much in return. The team could still use some outside shooting and a truer point guard to play behind Stephon Marbury. Nate Robinson shouldn't be on this team. But these are all questions for another day and time because right now is about the thought of how the Knicks are going to feast on the flabby insides of the East with their new monster. Randolph is a bona fide All-Star that got his 23 points and 10 rebounds a game playing out West where men are men and so forth but in the East? 30 on Philly, 30 on Atlanta, 30 30 30 30. A devastating combo with Curry down low and Randolph in the mid-post. Miles of space for Q to shoot. Myriad options for Marbury and Jamal Crawford for dishing when they drive. It's exciting stuff for the middle of the summer. I like this move. You added a lowpost scorer and subtracted a really bad contract in Francis. This was a step in the right direction for the Knickerbockers. What's New In Jets Land? Who's #7 On The Knicks? How Can You Walk With Four Balls?